Hidden pilot system does not distract from view. Viewing Area: H 29" x W 33-1/4"
When the view is this good, you want to be able to see it from every angle. That is why the new Atrium by Marquis is an ideal 3-sided designer option to divide entertaining areas and create maximum impact and warmth. 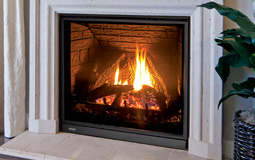 Our Peninsula can be customized with your choice of brick liner, driftwood, logs, ember glass or rocks. With so much style and attention to detail, it is no wonder people are focused on the view indoors! With an expansive glass viewing area and clever designer options, we thought the new Bentley was pure designer perfection. Now we have intorduced the new see-through Bentley ST by Marquis which means you get the same view... twice! Being able to enjoy the beauty and warmth from both sides means we have doubled the reasons to love the Bentley ST. 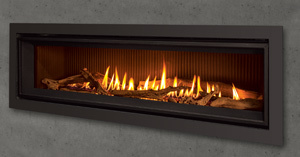 It is easy to agree on a fireplace when it is this spectacular! Introducing the multi-sided Gemini - it is the perfect solution as a dramatic room divider or corner focal point in a great room. 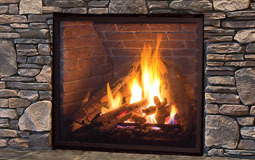 Build the hearth of your choice around this statement fireplace and you will find yourself taking sides over which view is the best. 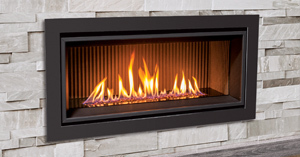 Add a sleek stretch of dancing flames to any room with the Infinite. Completely contemporary and endlessly flexible, the Infinite is now available in 35”, 42” and 60” glass or a two-sided option - all available with Black, Pewter and Stainless Surrounds. Nothing draws you in more than the beauty of the Skyline II. 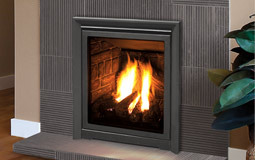 This sophisticated gas fireplaces makes a lasting impression with its wide-view appeal and flexibility. Customize your look with rocks and driftwood, decorative stones, cannonballs or ember glass in a choice of colours for a sleek, contemporary look. There is nothing subtle about this Skyline. 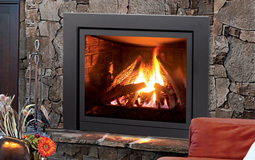 It is pure sophistication that makes a statement with wide-view appeal and flexibility. 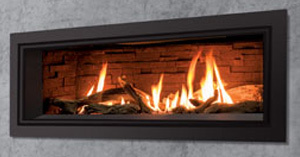 Choose from the rocks and driftwood, decorative stones, or ember glass in a choice of colors for a sleek contemporary look.